Who are First-Generation 2YC Students? SAGE 2YC > Support First-Generation Students > Who are First-Generation 2YC Students? First generation college students are those whose parents have not obtained education beyond high school. But beyond that most basic definition, this is a diverse group of students with traits, motivations, and challenges that distinguish them from other types of students. First generation college students are, in many ways, pioneers of their families and peer groups. They strive to seek a higher education despite the lack of immediate role models and family influences. Those of us with strong family traditions in higher education may underestimate the value of having one's parents shape educational expectations, culture, and pathways. For example, Horn and Nuñez (2000) point out that the stage is set for academic success in college as early as middle school. Nonetheless, first-generation college students press on toward college without following a familiar example. While there have always been first-generation college students, their numbers are increasing (Ishitani, 2003). This is a hopeful trend as higher education reaches a broader and more diverse audience. But the journeys of first-generation students can be challenging. Before addressing specific challenges and strategies to support first-generation college students, it's helpful to take stock of the characteristics of this population. While much of the literature addressing first-generation students focuses on 4-year settings, or lumps two-year and four-year students together, there is at least one study that presents the specific viewpoints of first-generation students at two-year colleges. The 2001-2003 Faces of the Future survey conducted by the American Association of Community Colleges was analyzed to reveal differences between first-generation community college students and their peers (Nomi, 2005). While this study is not as current as we might like, it is used here because it directly addresses the audience of interest. Thus, the graphics and much of the data on this page is drawn from the Nomi (2005) paper. First-generation students make up 45% of the student population in public, two-year colleges, and they represent a demographic that differs somewhat from traditional students. Two-thirds of first generation students are women. First generation students are slightly older than traditional college-age, with a median age of 24. About one-third of first-generation students at 2YCs are minorities. In 2003, 53% of Hispanic students, 43% of Native American students and 41% of black students in community colleges were first-generation students (Nomi, 2005). It's worth noting that this same demographic is under-represented in STEM disciplines, particularly in the workplace in STEM fields (Bidwell, 2015). Their life circumstances are also different from their continuing-generation counterparts. Compared to continuing-generation students, they are more likely to be employed full time and to be the primary source of income for their households. 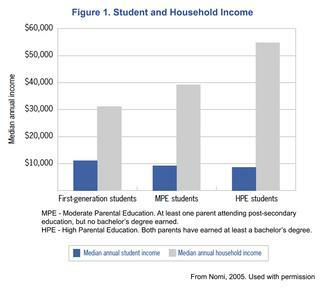 Because of their role as family wage-earners, first-generation students have a higher personal income than other students, with an average annual income of $11,000 during the period from 2001-2003. However, the total household income (which includes income earned themselves and also by other family members) is much lower (see Figure 1). A majority of first-generation students support dependents, whereas traditional students are more likely to be dependents. 55% of first-generation students rely on financial aid as a major source of income for college expenses, while only 14% rely on their parents as a major source of income for college (Figure 2). Nearly half of first-generation students (47%) list personal financial problems among the challenges they face while attending college. Other problems cited were the cost of computers and family responsibilities. A majority of first-generation students (65%) felt they could not have attended college without financial aid (Nomi, 2005). While continuing-generation students frequently enroll in two-year college with the intent to transfer to a four-year program, this is less common for first-generation students. 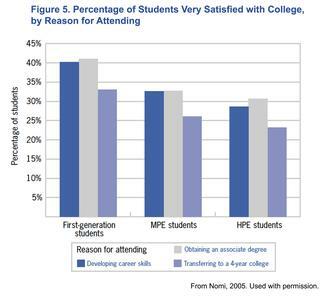 Career preparation is the most common driving force for first-generation students (Figure 3). A majority of first-generation students (87%) state that obtaining a steady, secure job is a very important accomplishment. While this is a common goal among 2YC students, it's an even stronger trend for first-generation students. Similarly, first-generation students are focused on improving their earning potential. This career-driven motivation is reflected in the course selection for first-generation college students. They take fewer courses in math and science (Pascarella et al. 2003). First-generation students list the major contributions of their college experience as: Learning job-related skills, Identifying the training or skills required for a career, Developing self-confidence, Learning to use a computer. To enter the workforce after a major life change (Nomi, 2005). 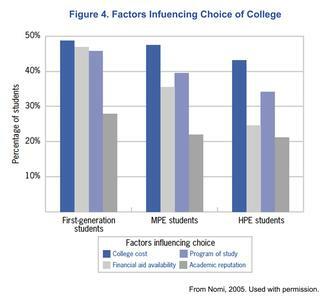 Cost, financial aid, available programs of study, and academic reputation were cited as important factors for first-generation two-year college students (Figure 4). As for all two-year college students, the price of higher education is the most influential factor in selecting a particular college. First-generation students are more likely to seek colleges with available financial aid. The programs of study were ranked as much more important by first-generation students than their peers. Academic reputation was also more influential for first-generation students than for continuing-generation students (Nomi, 2005). 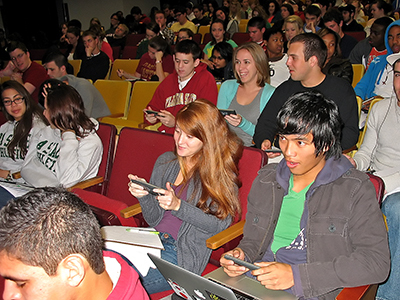 First-generation students take fewer courses than their peers. About half of first-generation students enroll in three or fewer courses at a time. This reflects the need to balance coursework with the demands of family and employment. Despite their challenges, first-generation two-year college students were more satisfied with their college experiences than their cohorts whose parents attended college. First-generation students were more likely to report that they received the help they needed from the financial aid office. Students who attended college with the intent to develop career skills or obtain an associate degree were more satisfied than those whose primary purpose was to transfer to a 4-year program (Nomi, 2005). Bidwell, A. (2015). STEM Workforce No More Diverse Than 14 Years Ago. US News and World Report. Published online at http://www.usnews.com/news/stem-solutions/articles/2015/02/24/stem-workforce-no-more-diverse-than-14-years-ago, accessed Oct. 16, 2015. Darling, R. A., & Smith, M. S. (2007). First-generation college students: First-year challenges. Academic Advising: New Insights for Teaching and Learning in the first year. NACADA Monograph Series, (14), 203-211. Horn, L., & Nuñez, A. M. (2000). Mapping the road to college first-generation students' math track, planning strategies, and context of support. DIANE Publishing. Ishitani, T. T. (2003). A longitudinal approach to assessing attrition behavior among first-generation students: Time-varying effects of pre-college characteristics. Research in higher education, 44(4), 433-449. Pascarella, E. T., Wolniak, G. C., Pierson, C. T., & Terenzini, P. T. (2003). Experiences and outcomes of first-generation students in community colleges. Journal of College Student Development, 44(3), 420-429. See the complete list of all references used in this module.